Been so long since I got first! Or since I commented at all lets be honest. It's nice to see you again, Octaboona. I think this one if my favourite out of the three of them!! I have also decided to name him Olly with Mister as his nickname, cause that's what I kept calling him before choosing the name. But not for the whole day. Plus he hasn't started peeing yet. Does anyone know how old they are when they need to start using a litter box? Is this really the FINAL cover? No, right? I don't mean to be disrespectful but... this looks like done by someone who's only just discovered that photoshop actually exists. the truck looks like it is floating (should it be? ), the smoke is out of the overall colour scheme, and whatever the red thing (mountains?) behind the silhouette of the pines should be - it doesn't fit, and it doesn't go particularly well with the orange background. And what's with these antlers? Leaving aside the point that Amber (the girl IS Amber, right?) had horns, real horns on the first cover - these antlers look like they're cut from a reference and pasted into the final pic without blending, rendering or ANYTHING to make them belong. The contrast is too weak and the transition from hair to horns is pretty ill done. Besides, if the whole picture is bathed in orange light the horns should have some highlights (and strong shadows), too. Also, the way that one strand of hair flows across the right anlter is utterly illogical. If this were a piece of fanart, of course I wouldn't be that strict, or even point out these things, mind you, but assuming this has been done by a professional it's... poor. 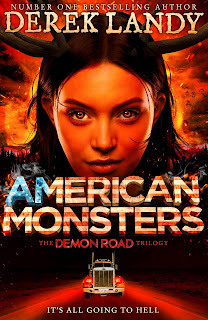 (I hate to be harsh but honestly I prefered the title with just the black background, Derek's name and 'the epic conclusion to the demons road trilogy' than this front cover. It isn't bad per say but I must admit I'm very underwhelmed by it. No offense intended of course, but I must say I definitely prefered the first two covers and all the skulduggery covers to this one. For I, the great Dugglyn Carzainia, am here. (I am coin English at a level now ^.^ and I love it! (I am such a quiet person normally ! Noelle's life has fallen apart. I fell asleep at 6:30 PM, woke up at 11:54 PM. I've been awake since then. Usually I try abd take people at face value and usually I never understand people,but today I've realises that if you assume everyone is lying the whole time people are soooo much easier to understand. (Sister: Would you rather die from a volcano or a tsunami? Kayleigh: Volcano. I wouldn't want to die to a wave. Kayleigh: No the lava and stuff. Me: what about pyroclastic flow? (Okay :) Hmmm.. Permission to halm but not kill your characters? Race you to the kids. Sil: Inky needs your help. She's hurt her leg. Chris; *huts the floor* w why? Inky: *shifts* get her away!! Tegan : *sniffles* w what did you do to u uncle Chris? Shame on you, Landy. Oh how the mighty have fallen. Sil: Uncle Chris hasn't been sleeping enough so they sent me to make him sleep. I have been thinking about the lack of words in the blog - and really, what IS Mr Landy to say if he agrees with us? He can't say stuff like "yeah look, this is the new cover - but I really think it's sh*t"
he kinda HAS to post it though, since it is the cover of HIS book - but usually he always praises his covers, doesn't he? so maybe no comment could actually be a comment in itself? Who's this cutie? I don't believe we've met. What have you done to my fiancé? Sil: Let him have a nap. Inky, see to the vermin. Vampire, stay still. Chris: I'm f fine now... Im sorry I couldn't protect the kids..
MrBBWolf: Inky is dealing with her. I hardly need to explain myself. Chris: shall we go back? Inky: what do you want with my kids ? Now what was that for? Give it time. They'll forget. They always do. I'm soooooooooooo glad you've finally stopped being boring. I mean, I almost left! Nothing really was happening and I could alway go somewhere else, maybe back to the normal world, but I do like this place. Well, how long was it really going to stay calm for? Anyway, running time! MrBBWolf: that doesn't mean she won't try again! Inky: it isn't his fault honey *limps to Chris: you okay? T-the vampire tried to t-take Lilith and she s-stabbed Chris. And hurt Ink-ky.
Sil: Okay, so. An injured wolf an furious succubus a weird scaly man and a time warper. That's an... interesting group of people you've managed to tick off. Will they come after you? Sil: they're useless so probably not. Oh. Well that's slightly disappointing. Where's the chase, the fight, the adventure?? Sil: what can I say, people round here love me too much. I can't believe it. Oh my llama intestines! And soy, I don't currently have anyone else's face to take so I'm stuck with mine. So where exactly are we going? Sil: Well I mean I could annoy them more but with that many of them I'd struggle to get out.. Hmmm..
You could also annoy someone else. Mrbbwolf: are we g-going after h-her or not? Uh, I don't actually have any idea. Inky; we may get hurt if we do..
Mrbbwolf: But she might come back. Sil: Hmmm.. I could annoy the wolves..
Do you know if they have any mental barriers? Because there's no way I'd be able to out run or out fight them. (Oh wow, I like your new face! Sil: Hmm.. I know. Is there anyone that everyone would protect because they're just too wimpy? Other than the children. Hmm. Ashlea is a wimp. Ah, yes. That she is. Sil: How about we see if we can lure out the other wimps. there are clones? do i have one? Sil: Okay. Beat her up a bit then drag her back. Mrbbwolf: I'm fine. Inky need to go to her bed. Does she have any mental barriers? Sil: She has a few from what I remember.. I don't think we have! Would you like a mint? Look! It's the exact same colour as your shirt! I'm Ashlea Crimson! It lovely to meet you! Lovely to meet you too!